Sometimes I am a little slow to read or find articles posted the same week as my “Follow Friday” and at least one of the posts below is from a couple weeks ago. I’ve still read it this week! Susan Peterson explained how easy it is to Create Your Own Clip Art for blog posts. She has some great tips! To piggy-back on Susan’s post, I ran across 6 Steps to Organize Your Blog Images on Tonia Kendrick’s “Solopreneur Diaries” website. Are you on Pinterest? Are you following Geneabloggers? If you haven’t followed yet, I urge you to do so – there are many boards there (Genealogy Bargains, May I Introduce You To…, DNA Genealogy, Photo Resources for Genealogists, etc.) that may help in any aspect of genealogy, research, websites, photos, or blogging. What useful tips or articles have you found this week? The blog post that had me by the heartstrings this week was from DNAExplained by Roberta Estes about a daughter that was born too early and passed away without a name or a proper good-bye – The Invisible Child. Her article made me think about my own mother who lost a child at 5 months gestation. Randy Seaver, at Genea-Musings, never fails to amaze me with tips, ideas, how-tos, or some humor. Yesterday, he posted Ancestry.com Provides a Relationship Calculator, and my first thought was “are there still people who aren’t familiar with that?” I was thinking that it is the line on the person’s profile that says “2nd great-grandmother” – etc. But then I started reading the article! It is not what I thought. Once again, Randy told me something I did not know nor was I aware of! I believe that Amy Johnson Crow is my hero when it comes to Ohio research! I learn new and interesting things about researching in my home state. Her article, 5 Ways to Prepare For Your Courthouse Research Trip, is not just for those with Ohio ancestors. This couldn’t come at a better time for me because I’m planning on doing some courthouse research this summer when I’m in Ohio. Thank you, Amy! Denise Olson (Moultrie Creek Gazette) provided some tips on publishing a family history book in Build Family History Books with BookWright. There are many types of services to do this, and Denise helps narrow down those choices. No Fooling! Here’s a few of the articles that I’ve read this week and want to share with my readers. Since I was born and raised in Ohio and at least three or more generations back called it home as well, I appreciated Amy Johnson Crow’s article 5 Hidden Treasures for Ohio Genealogy. Although I’ve used a few of her suggestions, I sometimes tend to forget about them. Now I can make sure they are bookmarked when I need to refer to them. Do you have an ancestor or collateral relative who fought in the Civil War? My 2nd great-grandfather, James Emory House, was a member of the Ohio Volunteer Infantry Co. H, 80th Regiment. Do you wonder if your ancestor was at the Battle of Gettysburg or Vicksburg? Follow the advice that DearMyrtle gives in: Was He There When His Unit Fought in the US Civil War?. Lynn Palermo (The Accidental Genealogist) shares Seven Timelines Apps to Share Your Stories. Do you have tins or jars or boxes full of buttons, trinkets, or other household paraphernalia? Have you inherited them from your mom, aunt, or grandmother? What stories does that jar of buttons hold? Denise Levenick, The Family Curator, provides some advice in dealing with items that others would consider “junk” in Why You Don’t Want to Toss Grandma’s Buttons in the Trash”. I especially loved the ending – but don’t read ahead! 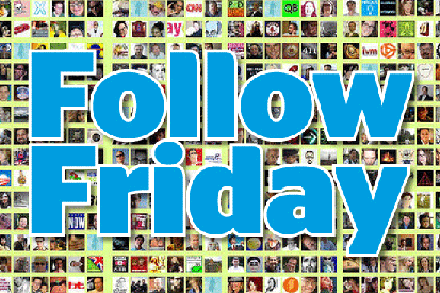 That’s all for this edition of Follow Friday! Do you add metadata to your digital photos? I guess the bigger question would be do you know why you should? You know all those boxes/albums full of old family photos that you have? How many times do you think “why didn’t anyone list who, what, why, where, when, and how?” so you wouldn’t be left scratching your head and trying to figure out that information. Metadata serves the same purpose. It gives you the information you need – as well as a source. Did you inherit it from your paternal grandmother? Was it part of a scrapbook from your favorite aunt? Was it a loose photo stuck inside a Bible or letter? You will want to source all of that so in five years when you pull up a photo from the cloud or your hard drive, you aren’t scratching your head trying to put it in the right context. Judy Russell, The Legal Genealogist has written a wonderful article about this – Repeat: an image citation how-to. Go read! Yesterday, I posted a photo of Ellis Island and a link to Megan Smolenyak Smolenyak’s article about Annie Moore. Last night, Megan posted on Facebook that she had found Annie’s relatives! Here is the story – Generation Saga: Relatives of Annie Moore Traced. Fascinating story! This past week, the story of the Purple Heart found at a Goodwill store was making the rounds on Facebook. Within 24 hours, a family member had been found! Power of social networking! Here’s just one article about it – Purple Heart Found at Goodwill. Last but certainly not least, I want to call your attention to a photo/travel blog with excellent photos of landscapes, nature, events, and animals. Recently, Broughton Images spent a day in Dallas photographing the skyline. Go check it out! You can also follow on Facebook. In the last few days, Thomas MacEntee of Geneabloggers made two announcements. The first was a brand new genealogy mailing list (and before you groan and think “not another one!” – just remember that this new one will be filled with “news not just for bloggers or ‘technies,’ but will include something for every member of the genealogy community.” UPDATE: The website is back up – so go to Geneabloggers and look on the right hand column. The other piece of news from Thomas concerns the Geneabloggers website – you can read the article at Open Thread Thursday: How Do You Handle Change?. If you want to create a report for your sources, Randy Seaver of Genea-Musings posted several articles this week: Creating a Specific Source List Report in RootsMagic 5, Creating a Specific Source List Report in Family Tree Maker 2012 (and the update to that post is found here and here, and Creating a Specific Source Usage Report in Legacy Family Tree 7.5. Thanks, Randy! A news story from today concerns Forensic Genealogist, Melinde Byrne, and Police Chief, David C. Bailey, from a town in New England – Former Chief, Genealogist Continue Trying to Identify Body. Sheri Fenley, of The Educated Genealogist posted about her recent trip to Rhode Island. If you plan to research there, please read her insightful article – Office of the Town Clerk in Rhode Island, as well as this post – New England Hospitality – to see some great photos and read about Sheri’s time with other genealogists and friends! Here is a list of what I’ve been reading “around the web” lately (in no particular order). Review: Finding Family by Judy Russell on the Legal Genealogist Blog. Judy reviews a book about the journey of an adoptee. There are many blog posts and articles about the closing of the Georgia archives. If you google “Georgia Archives” – you are sure to find one of the many articles. This is very sad for all those who rely on the Archives for historical, biographical, and genealogical information. Update: Click here to read an update about this – it looks like the Archives will remain open! My Heritage Automates Record-Matching as Genealogy Wars Heat Up (Europe) from Gigaom. Interesting article about what the top two (according to the article) genealogy companies (Ancestry and MyHeritage are doing to compete technologically. There have been several reports of people adding QR codes to their loved ones headstones and this is one of those. What do you think? Will the QR code be outdated in the next big wave of technological advances?